THE SESSIONGRAPHY ANALYSES INCLUDES TABLES AND GRAPHS WHICH ARE SHOWN TO THE LEFT BELOW. 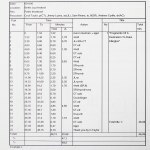 CAN BE BEST STUDED ON THE CD-R FROM JAZT TAPES BUT ANALYSES ARE ALSO ADDED AT THE BOTTOM OF THIS PAGE. "Unit Structure", Session No. 66-0519. Many sessions have been analysed regarding time for each different part in every tune. 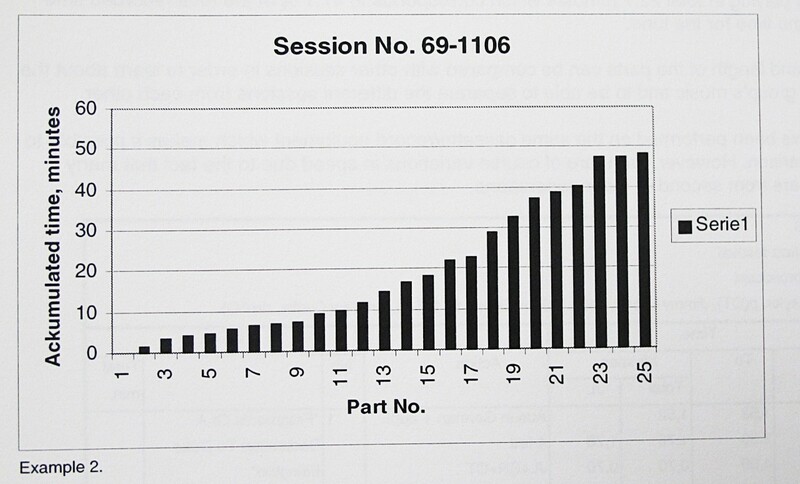 In the following example, from session No. 69-1106. 25 parts have been separated in minutes and 100:s of a minute. 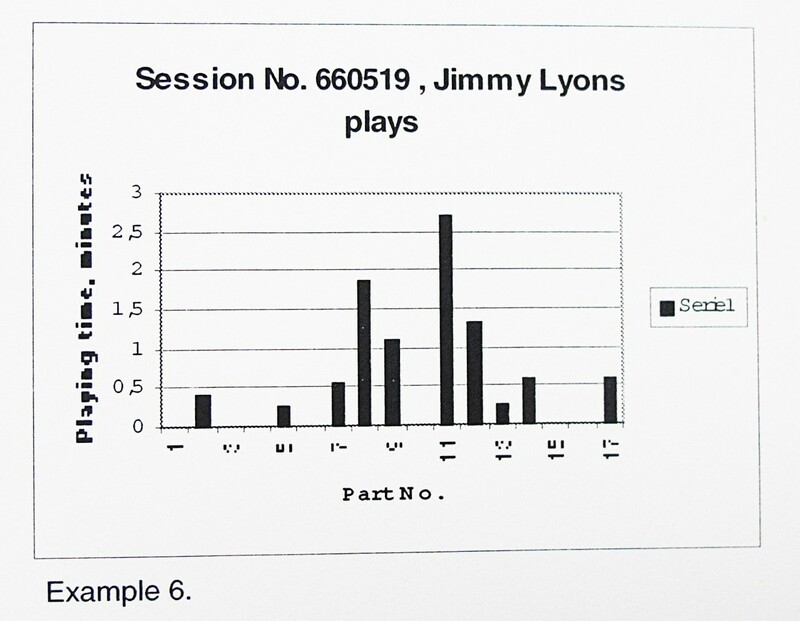 Jimmy Lyons is playing in total 22,7 minutes which corresponds to 47,1 % of the total recorded time and 49,2 % of the time for the tune. The sequence and length of the parts can be compared with other sessions in order to learn about the structure of the group's music and to be able to separate the different sessions from each other. All analyses have been performed on the same cassette or CD equipment which makes it possible to make the comparison. However, there are of course variations in speed due to the fact that many obtained tapes are from second or older generations. For details, se JaZt Tapes, CD-32. This method also proves that the music played by Cecil Taylor's groups had well rehearsed structures. Jimmy Lyons has said that, the groups rehearsed every week even if there were no gigs for months. 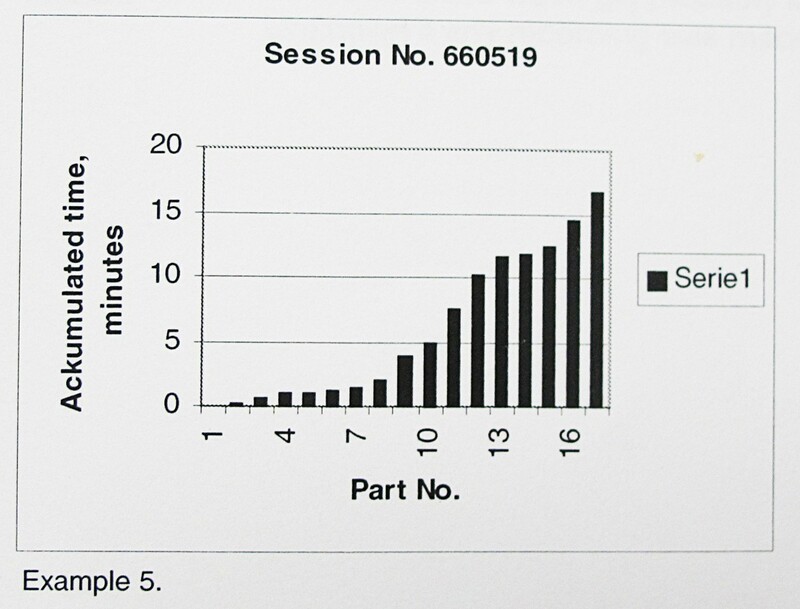 The following graph shows the accumulated time in minutes for the 25 parts from session No. 69-1106. 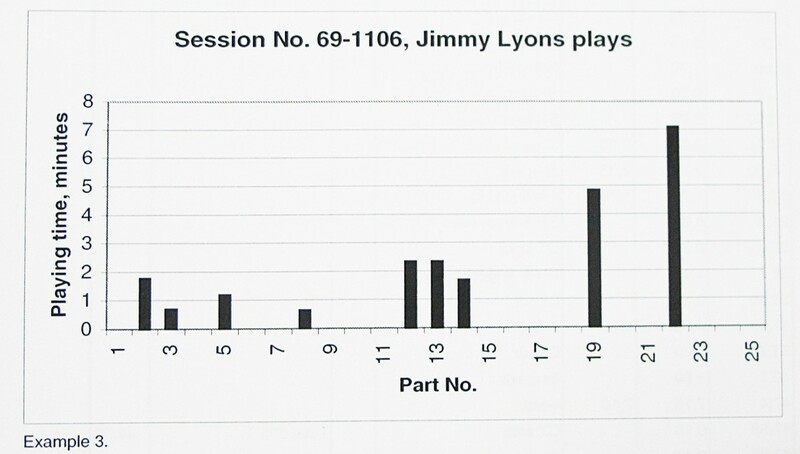 The following graphs shows in which parts Jimmy Lyons plays and the playing time in minutes for each part from the same session. 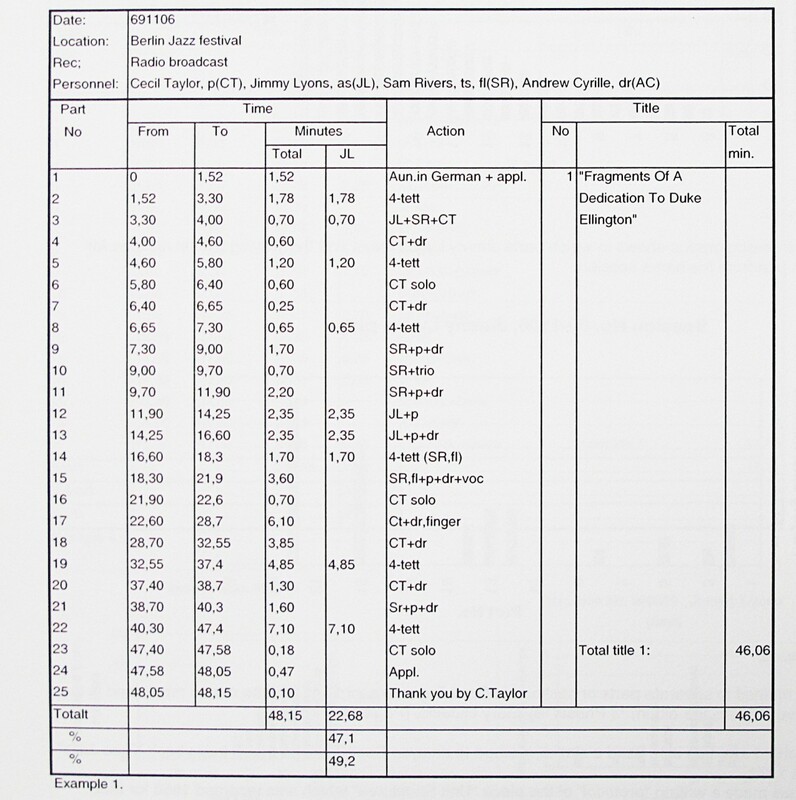 The method to separate parts or sections in Cecil Taylors recordings by time is also mentioned in the sleeve notes to the album "3 Phasis" by Gary Giddins. .
Ekkehard Jost has also used a similar method to analyse Cecil Taylor's music in his book "Free Jazz" from 1974. He has made a written "protocol" of the piece "Unit Structures" which was recorded 1966 for Blue Note. The different parts are called sections and he has given the time when each section begins. Instead of showing the parts in graphs, Jost analyses in words exactly what happens in each chosen section which sometimes is as short as 5 seconds. 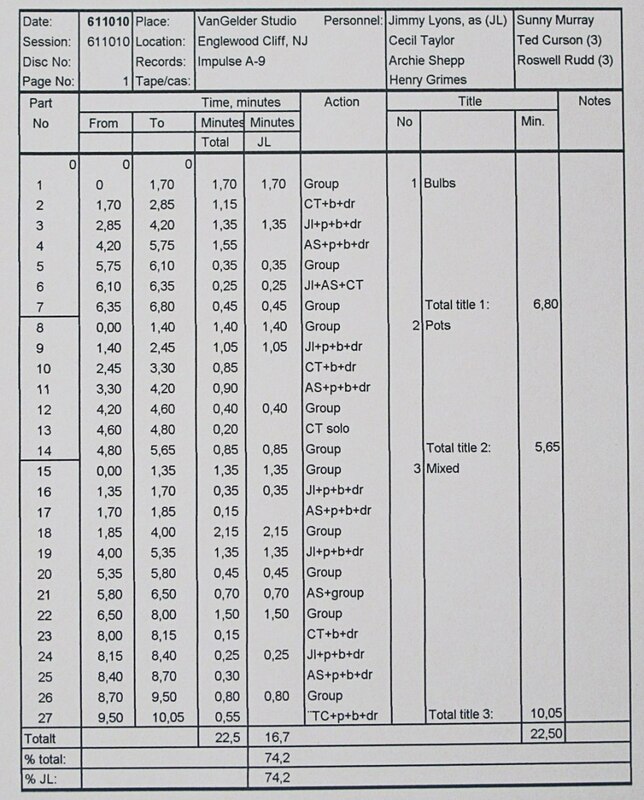 The piece, "Unit Structures", is analysed in 26 parts or sections and in 11 of the parts are also notations made which varies from 1,5 to 8 seconds. This is of course a very time consuming work but very accurate in order to describe the music in print. However, it would have been almost impossible to make the same for all the sessions in this work within a realistic time frame. 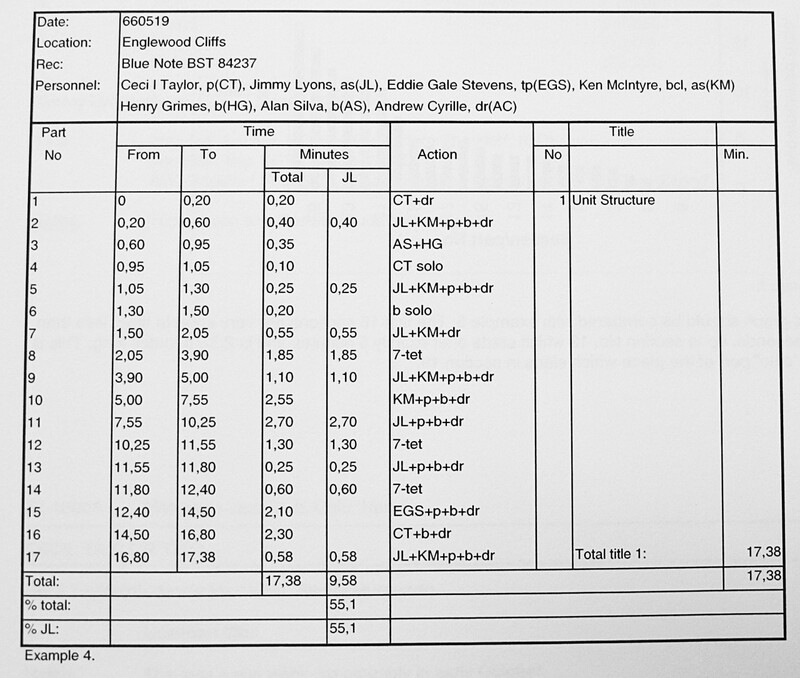 The same piece, "Unit Structure", 66-0519, analysed in relation more to how much Jimmy Lyons is playing is made in the following table (Example 4). See also the graphs in Example 5 and 6. 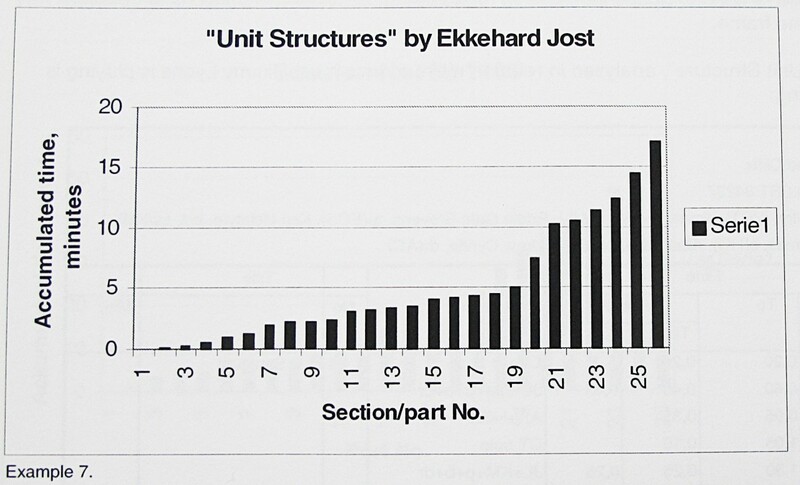 Instead of 26 parts, I selected 17 parts which fairly well corresponds to the same time structure as Jost has found. The main difference appears in part 8 and 9 where Jost has analysed 13 parts/sections instead of the two for me. This graph should be compared with example 5. The first 18 sections are very short in time, less than 30 seconds, up to section No. 19 which starts after exactly 5 minutes and is 2:38 minutes long. This is the "solo" part of the piece which starts in section 19.